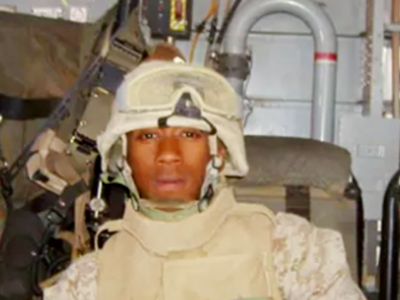 Thousands of fast food workers are expected to strike in 190 cities Thursday, demanding a $15 an hour wage, including Iraq war veteran Steven Wilkerson. He earns $8.50 an hour working at a combined Dunkin' Donuts (DNKN), Quizno's and Godfather's Pizza joint that's located inside a Hess (HES) gas station in Tampa. He spent over a year interviewing for jobs after he left the Marines before landing this one. Wilkerson believes the protests are leading to change, in fact, this will be his third time striking. After he picketed earlier this year, his manager began to train him to become a shift manager, a title change that should come with a raise. "I can't say that wouldn't have happened if I hadn't protested, but I think speaking out has made it happen faster," he said. Steven Wilkerson previously served in Iraq. 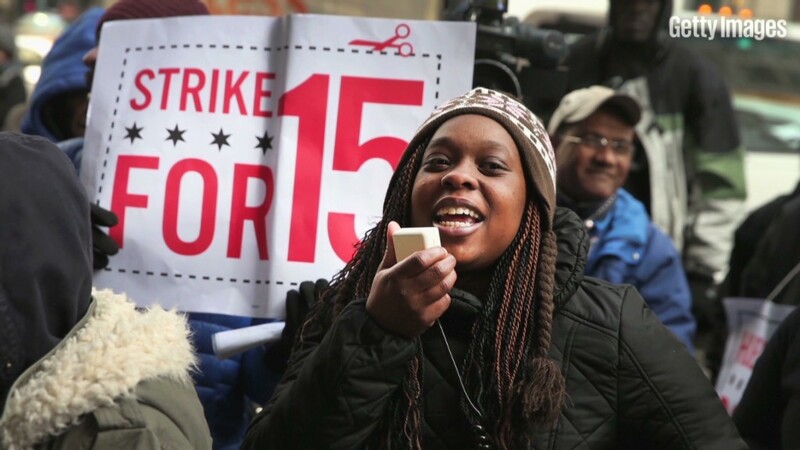 A lot has happened in the two years since fast-food workers first took to the streets of New York City to demand at least $15 an hour. The issue of fair worker pay is now on the public's mind, and state and local lawmakers have begun to respond. Dozens of states and cities have raised the minimum wage for workers in all types of industries to well above the federal minimum wage of $7.25. San Francisco and Seattle both voted to raise pay for local workers to $15 an hour. Chicago lawmakers voted on Tuesday to hike the city's wage to $13 by 2019, while Washington D.C. has adopted a plan to raise its hourly minimum to $11.50 by 2016. Starting next year, businesses with federal contracts will have to pay a minimum of $10.10 an hour, thanks to an executive order singed by President Obama. "When they were planning to strike and ask for $15 an hour in 2012, people thought they were crazy," said organizer Kendall Fells. "Two years later, it doesn't sound so crazy," he said. But none of the fast food chains, which are the actual targets of the protests, have committed to an across the board wage hike. In 2013, the average pay for restaurant workers was $8.74 per hour. 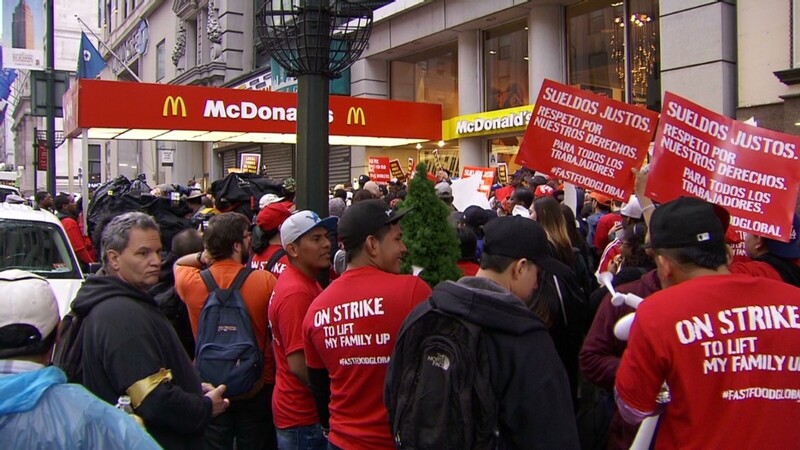 Workers from McDonald's (MCD), Wendy's, Burger King (BKW), KFC, Domino's (DPUKY) and other chains will strike Thursday, with some of the biggest demonstrations planned for Houston, Los Angeles, San Diego and New York City. This time, the fast-food workers will be joined by airport workers in nine cities, as well as home health care workers. They are all asking to be paid a minimum of $15 an hour.